When was the last time you danced? I’ve realized as of late, music has been somewhat non-existent in my life. When I’m working or in the car, I tend to have NPR for background noise and occasionally I’ll start up my pandora station. But for the most part, there hasn’t been music and there sure hasn’t been dancing. I go through phases with music and I think coming out of being around music all the time, I took a break. However, I’ve recently been digging back in. I pulled my bassoon out and started playing again, I’m listening to my favorite symphonies and piano concertos while I work, and when I’m in the kitchen, I have playlist going that I can sing and dance to while I move around the kitchen. I was further pushed to dance last night while I was at a concert (Trombone Shorty to be exact). M gets tickets to an occasional show thanks to his job but he ended up having to work last night. So I took myself out on a date and went to the concert alone. I stood in the back, bobbing my head to the beat and really just enjoying the sound of live music. “Dance!” I heard yelled behind me and then immediately following, an elbow nudged into my side, “DANCE!” the older lady yelled again but this time I realized it was directed at me. Once more, another jab and “DANCE!” yelled again at me. I smiled at her and started to move back and forth. Sometimes it takes a 60 year old women to reminder you to dance more often. Preheat oven to 400˚. Place cranberries in a roasting pan and bake for 15-20 minutes. Cranberries should have released their juices. Set aside to let cool. 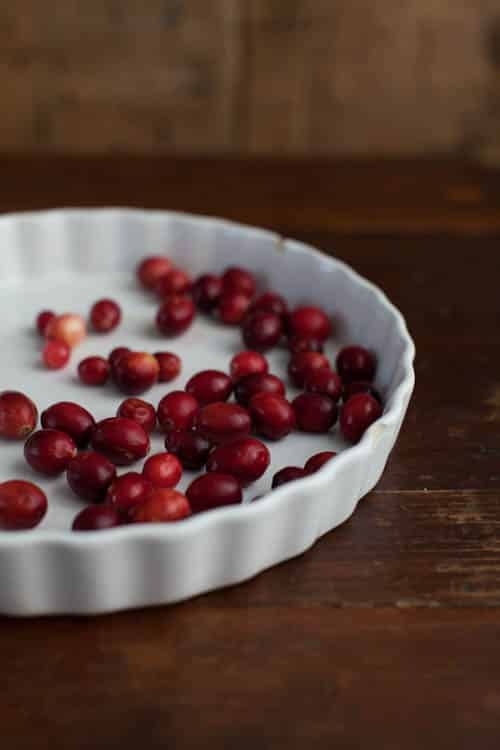 While cranberries are roasting, slice the vanilla bean in half and scrape out the seeds into a small sauce pan. Add the milk to the pan, bring to a simmer, remove from heat, and let cool completely. 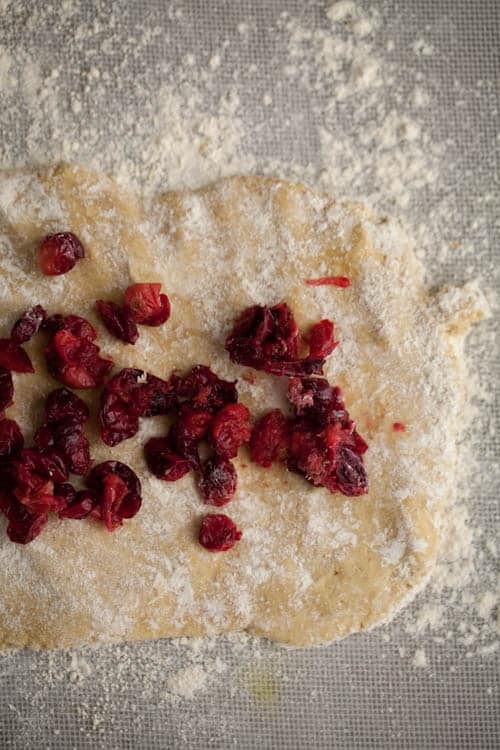 Once cranberries and milk are cool, whisk together Einkorn flour, baking powder, and salt. 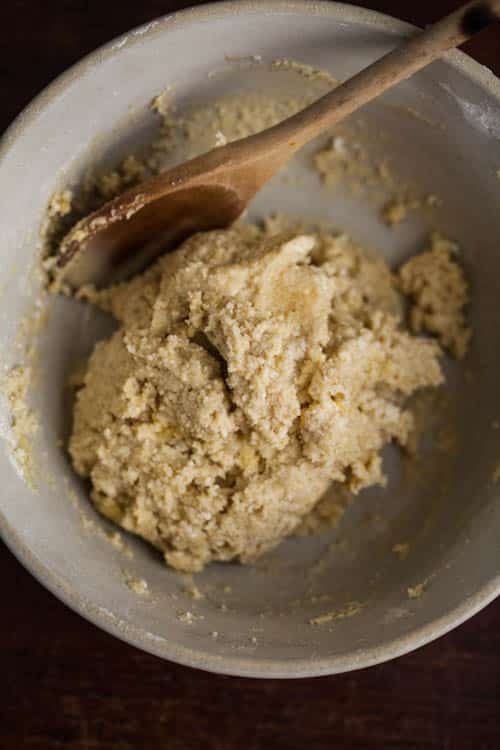 With your hands or a pastry blender, cut the butter into the flour mixture. Butter should be in pea size pieces. In a separate bowl, whisk together 1 egg, maple syrup, and milk. Pour into dry ingredients and stir until just coming together. 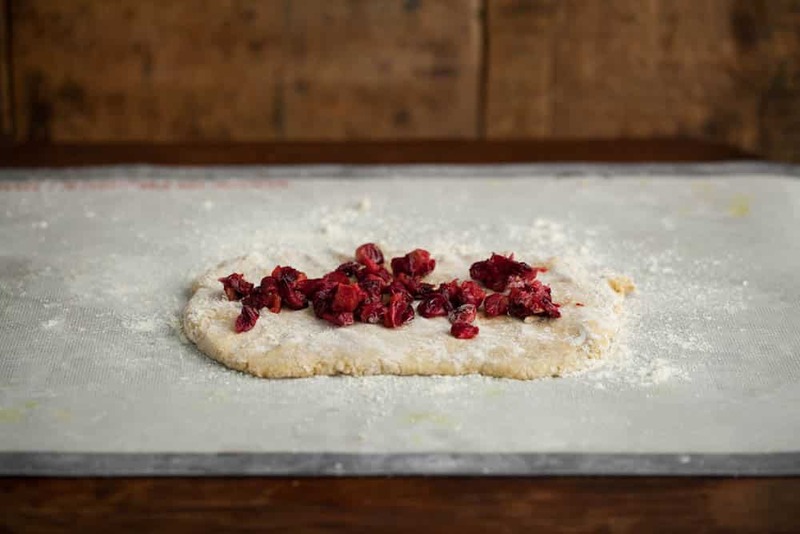 Scoop dough onto a well floured surface and pat into a large rectangle. 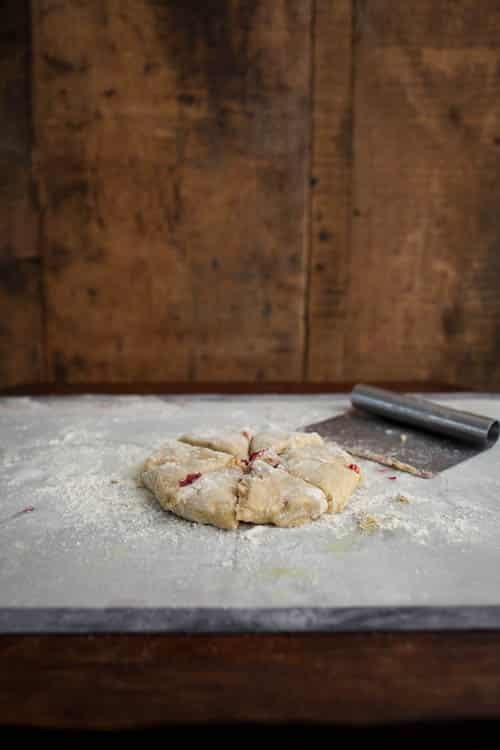 Spread cooled cranberries over dough and roll into a log or fold into a circle. 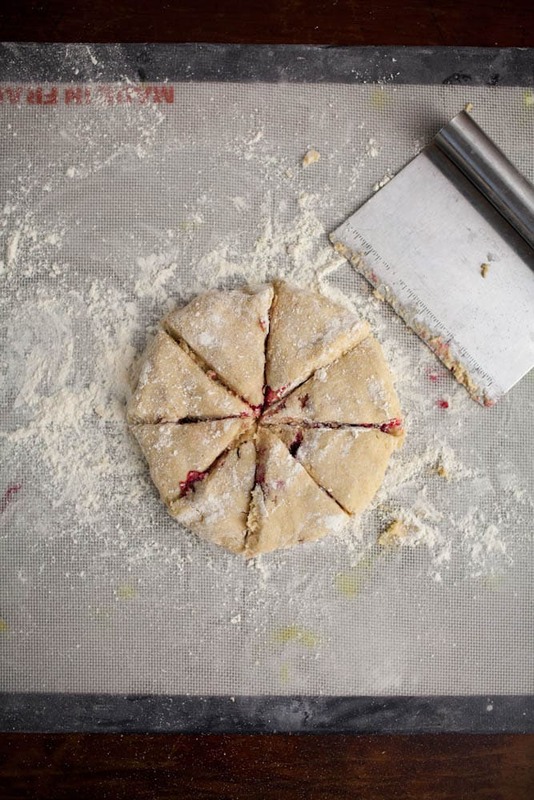 Cut eight triangles out of the dough and place on a baking tray covered with parchment paper. Whisk together egg and heavy cream then brush over scones. Bake for 20-24 minutes until scones are golden and firm. Remove from oven and let cool before eating. *You can sub whole wheat pastry flour or unbleached all-purpose flour for the Einkorn. I get a little obsessed with cranberries this time of year. 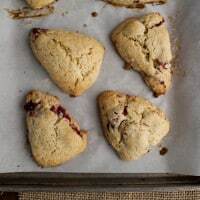 In the photo, it looks like you may have drained the cranberries of their juices after roasting and before spreading on scones. Or do they just not get “that” juicy? i adore this post, sometimes you DO just need someone to remind you to just dance, it’s always worth it! I have to admit, as soon as I saw the title of this post, my mouth started watering! What a lovely scone. 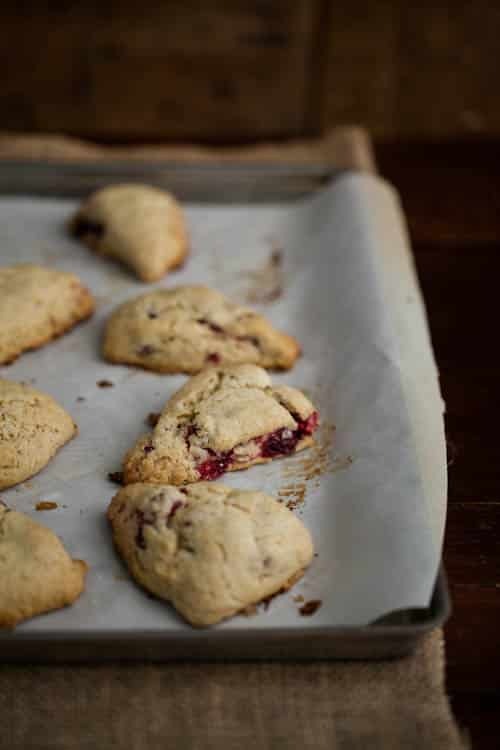 I’ve never used einkorn flour, but now I want to test it out. haha, nothing better than being yelled at to dance!! Lovely scones! 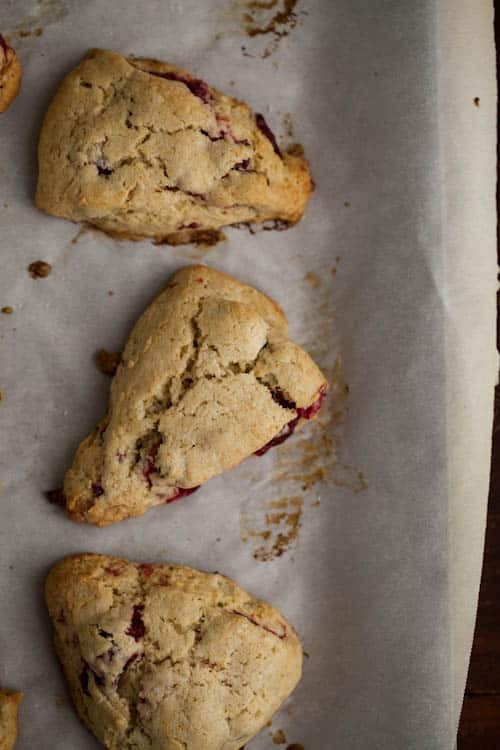 These sound perfect Erin, I love the combination of cranberry and vanilla at the best of times but in scone form? I’m totally sold. 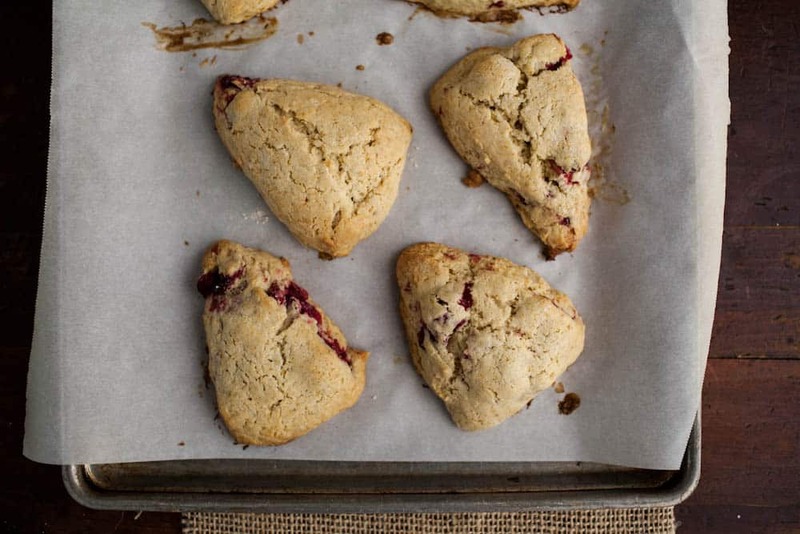 How delicious would these scones be for breakfast?! Let me tell you – amazing! what a great post! it makes me want to go bake scones while dancing around the kitchen :). These look SO good! I love the idea of the roasted cranberries – and adding the vanilla to the milk! Definitely will make these! 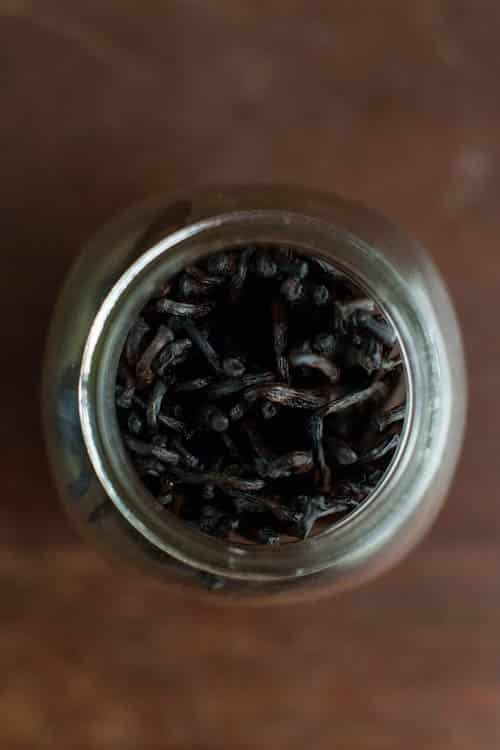 Holy moly…where/how does one get an entire jar full of vanilla beans? Excellent-sounding recipe, too! Hi, I just stumbled onto this recipe on Pinterest whilst looking up einkorn bakes. Now, admittedly, I used dried cranberries and vanilla extract (boo!) because thats what I had to hand and I wanted to bake immediately. These scones are delicious! Im going to try it on my kids later with some good quality vanilla ice-cream and see how they like it, but secretly I hope they don’t, oh dear!